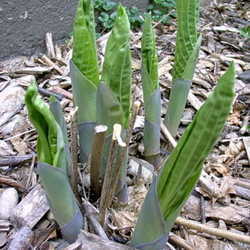 Although generations of gardeners have started seeds on sunny windowsills, the seedlings often end up tall and spindly. If you want flats of sturdy seedlings, but you don’t have a greenhouse, a light shelf is the way to go. 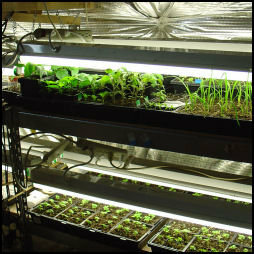 Seedlings don’t need full spectrum lights; the cool fluorescent tubes in a cheap shop light are fine. 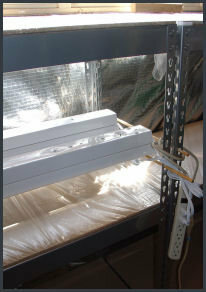 A fixture with two 48 inch fluorescent tubes will provide enough light for two standard nursery flats (1020 size) of seedlings. It’s important to set up the light so that the height can be adjusted to keep the light just an inch or two from the top leaves of the seedlings as they grow. If you use a bookcase or storage shelf unit, you can hang a light over a shelf on adjustable chains or ropes. Just hang the fixture from the next shelf up (or from the ceiling for the top shelf). A useful knot to know for adjusting ropes is the taut-line hitch. The fluorescent lights that most of us are used to seeing are T-12s, which use 40 watts of electricity per 48 inch tube. There are some newer fluorescent lights on the market now, and I especially like the slim 32 watt T-8 tubes. Their electronic ballasts don't flicker, making the light seem brighter and cleaner to me. I also appreciate having just a little extra clearance when my tomato seedlings start reaching for the sky. The T-8 tubes and fixtures are a bit more expensive than the T-12’s, but the difference is partially offset by the energy savings. Plant stands and shelves also come in a range of sizes and prices. 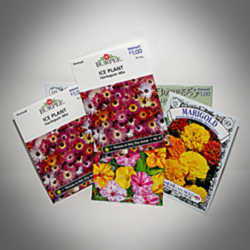 The Propagation Forum has had some wonderful threads on DIY plant stand plans. Here’s a link to a discussion of making plant stands from PVC pipe. If you need to keep pets or children away from dangling wires and delicate seedlings, try enclosing your shelves with screen panels. My light shelves are set up using Gorilla RackTM units that have metal uprights with holes for adjustable supports for 48x18 inch shelves. It turns out that I can put a quarter inch wooden dowel through those holes and use the dowels to support my shop lights. To change the height of the lights, I just move the dowels to a different set of holes. 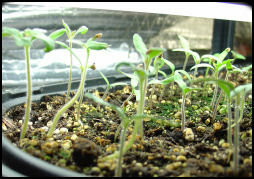 Your seedlings need at least 12 hours of light each day. Some people have good results running lights 24/7 for their seedlings. I usually run my lights for 16 hours on, 8 hours off. Putting your lights on a timer definitely simplifies things. Be sure to use a heavy duty timer that will take a 3 pronged plug. Using that third prong to ground the lights is important for electrical safety, so please don’t take shortcuts. Similarly, any extension cords you use should be heavy duty ones with 3 prong (grounded) connections. If you can connect it to a GFI outlet, so much the better. If you have any concerns, consult a licensed electrician. By May, I usually have 20 to 24 flats of plants under lights in the basement. 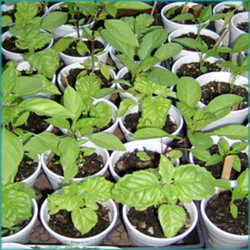 That may be more space than you care to devote to seed starting, but anybody can find space to start a flat or two of plants. I’ve heard of people putting flats on top of cabinets, raising them close to fluorescent office lights by stacking bricks under them. I recall one creative DGer who put a shop light across the rungs of two kitchen chairs and set a flat of plants underneath the chairs, on the floor. My first light shelf was set up in our utility room, over the washer and dryer. In the next Seed Starting article, I'll discuss heat mats – what they are, why they are useful, and some DIY alternatives to those sold in nursery catalogs. Edited May 2010 to add to the list of my seed starting articles below for easy reference.